It was a beautiful August day and my little sister's wedding had finally arrived. Everyone was a bit nervous, will everything go to plan, will the bride be on time, will the cars turn up to take us to the church, but what worried me most... what am i going to sing at tonight's 'Live Karaoke'??!! Lizzy the bride as usual took the whole day in her stride and got up with your fantastic band to start off the evening and sang her sparkly shoes off! I have been to lots of weddings this year and I have to say Live Karaoke Band provided us with the best evening entertainment. Who doesn't want to see their family and friends giving it all to the likes of Dancing Queen, Mr Brightside and It's Raining Men? My personal favorite, the bride and groom's rendition of We Will Rock You, however, surely Mustang Granny and Hillside Girl could easily be chart hits in the near future. 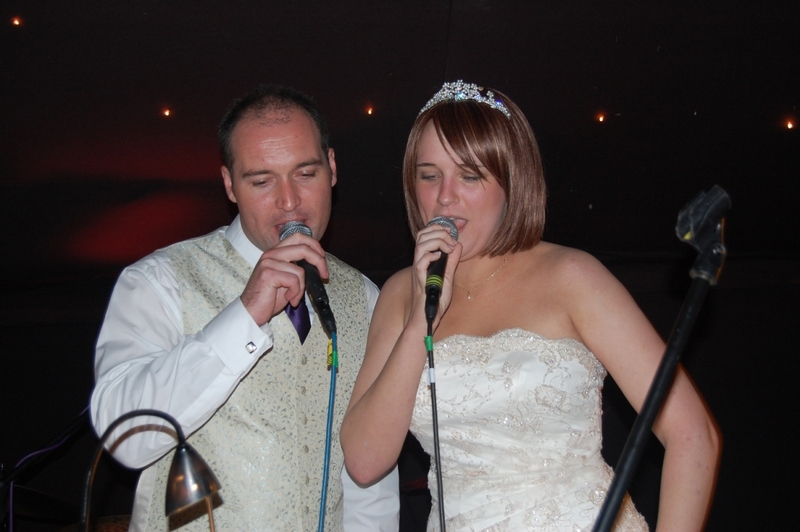 Who would have thought there was only one professional singer amongst our guests (the bride)?! Many thanks to your amazing band who got us through those bum notes and wobbly starts, provided fantastic entertainment and topped of the perfect day.